On Friday April 20 in the Santa Cruz Mountains, I drove up the little China Grade paved road to the gated road end then entering Big Basin State Park, explored the Hollow Tree Trail to the Middle Ridge Road and Johansen Road. 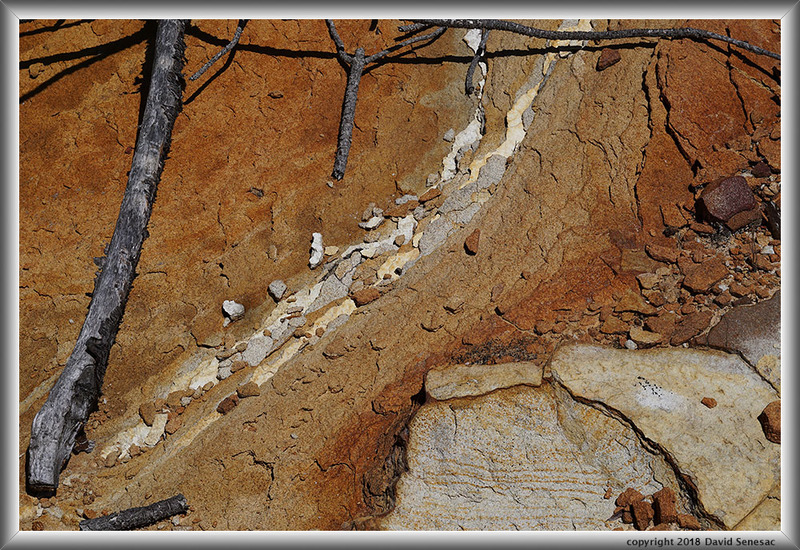 There I took the below modest close-up image of sandstone deposit layer patterns with some fallen knobcone pine branches. Three days later on Monday April 23, I hiked from the obscure Whitehouse Canyon trailhead in Cascade Ranch State Park up to The Chalks areas. The steep shady trail climbs from 600 feet to 1200 in second growth redwood forest including dense areas of redwood sorrel before leveling off on a xeric ridge line with knobcone pine and manzanita. Over the initial 300 feet of vertical near a seasonal stream, I counted 27 California newts on the shadowy trail, thus was extra careful looking where I stepped along the trail. 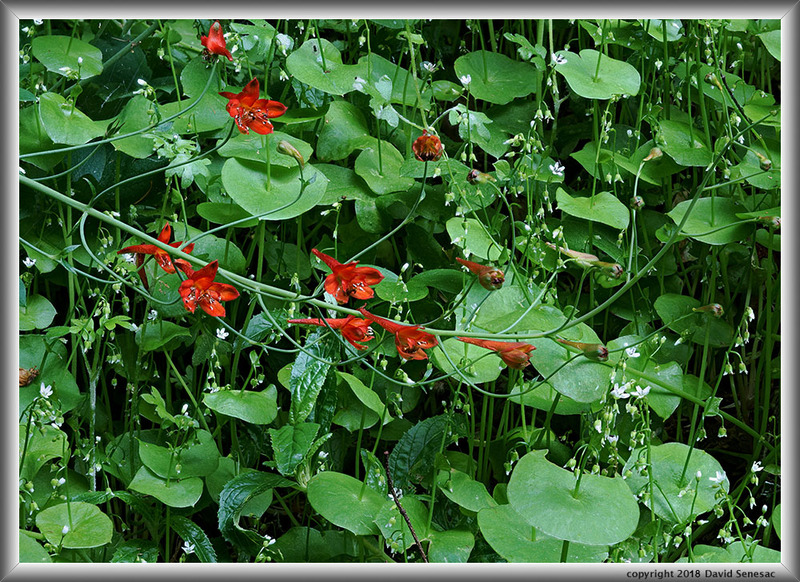 The below image shows redwood sorrel, oxallis oregana, with a couple of its white 5 petal flowers, and shiny green leaves of lily family red clintonia, clintonia andrewsiana, the red flowers of which would appear in a couple more weeks, one of the latest flowering species in our redwood forests. 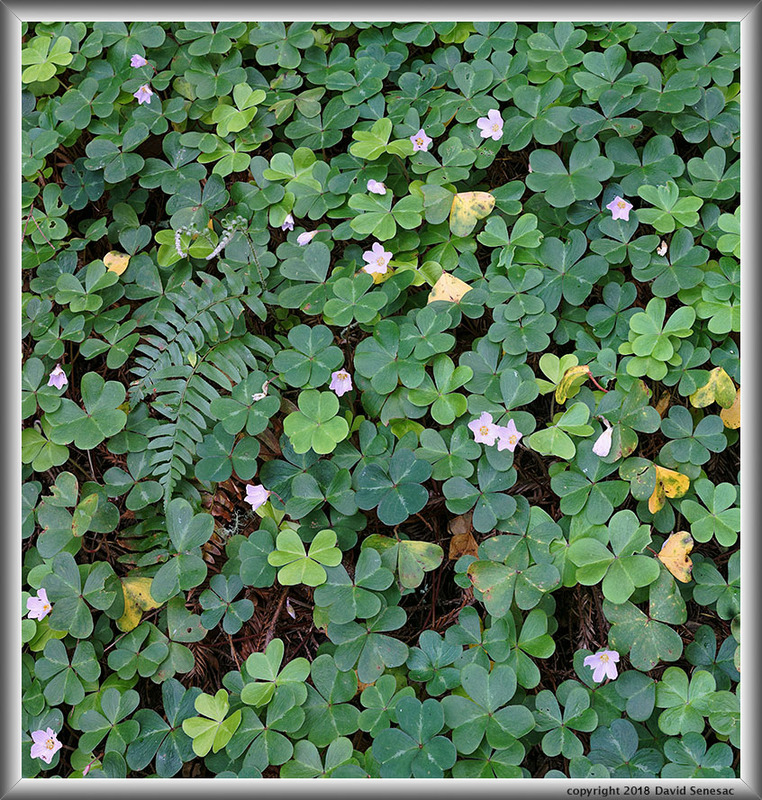 And below another close-up of redwood sorrel with a few blooming white to slightly pinkish flowers with yellow anthers. In fact, there was a larger dense expanse of these green plants than I have encountered anywhere else yet in the Santa Cruz Mountains. Additionally were patches of milk maids and redwood violets. During the first week of May, highway SR108 across Sonora Pass opened as well as SR120 from US395 to the Yosemite Park border. With new backcountry skiing binding adapters, I had an interest in finding out how they performed, thus considered a Sierra road trip. However weather was marginal for corn snow conditions and I was not enthusiastic about the 5 hour drive. 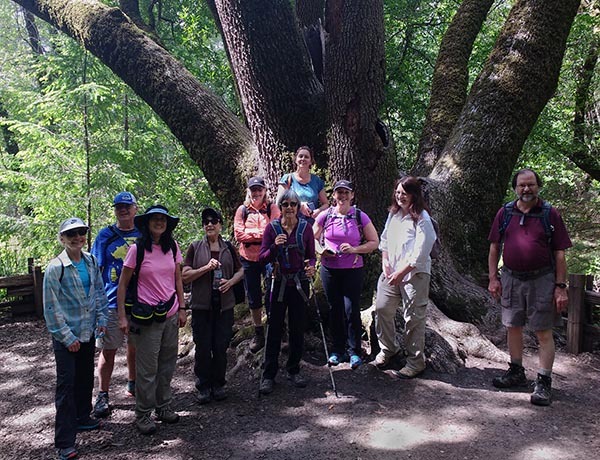 Thus opted instead to join a Thursday May 4 local meetup dot com hike in the Santa Cruz Mountains with 15 other people of which most were we retires including 10 women. 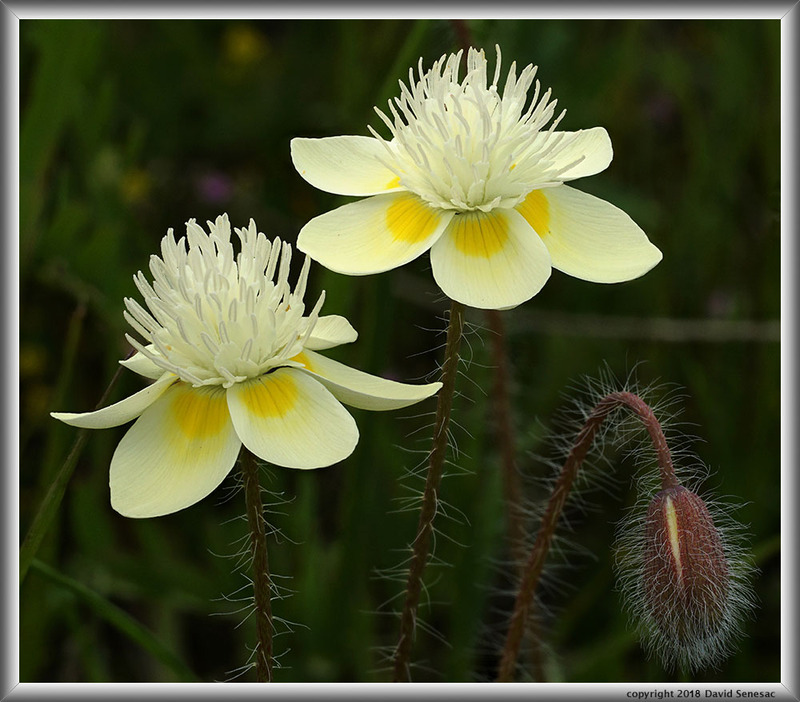 During that hike noticed a section of the Saratoga Toll Road Trail that had nice displays of wildflowers. I also had my first rattlesnake sighting of 2018 as the group approached Travertine Springs. That evening, I checked next day forecasts that showed a day with rather calm winds thus decided to go back out and work some close-up subjects. Leaving early was out on the trail by 8:30am Friday May 5 under skies with thin high clouds and indeed near calm breezes that I would need to focus stack blend sets of image frames. After parking along highway SR9 west of SR35 that is only about 15 road miles from my residence in Santa Clara County, I took a short cut onto the Saratoga Toll Road Trail in Castle Rock State Park at the 2400 foot elevation and after about 1/4 mile west found my first subject in the above image, the striking red larkspur, delphinium nudicaule, among lush moist miner's lettuce, montia perfoliata. There was a very slight intermittent breeze that was enough to jiggle the plants, thus I expected that meant quite a bit of post processing work would be necessary for such a complex mini jungle subject, blending together 11 images. It just takes the slightest movement between shots to be noticeable at the considerable resolution of the A6000 24 megapixel sensor. This trail zone had more red larkspur than I've encountered anywhere else but most of the plants were isolated on these shady slopes of douglas fir, madrone, and California bay, too exposed to the breeze moving slightly about. This subject on the other hand was rather tangled up in the dense montia with its little white flowers. Just off frame left I also braced the larkspur stem with a dried grass stem. High clouds were too thin to prevent shadows so I also had to hold up my 32 inch circular diffusion disk in order to allow better even lighting. 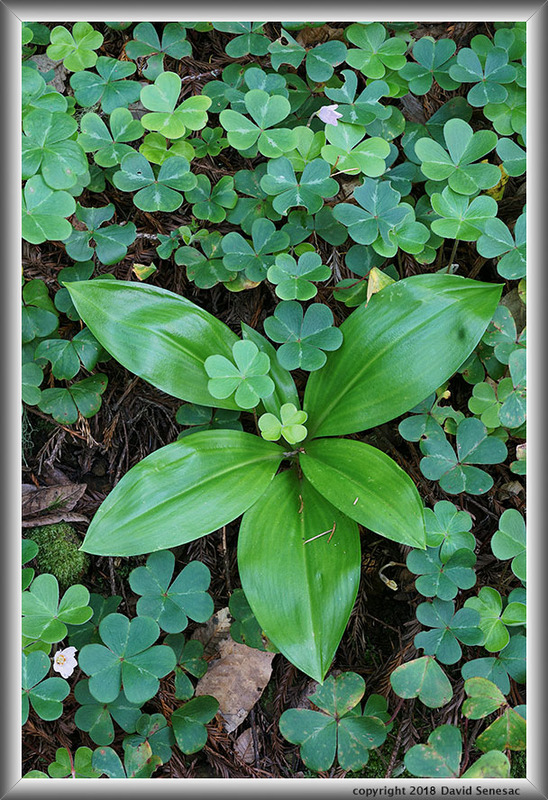 Although not well known by the large numbers of California hikers that walk our trails, the wonderfully juicy leaves and stems of miner's lettuce contain vitamin C and makes a delicious salad. And yes I eat some almost every time it is about while locally hiking. Later post processing this single subject took about 2 hours of tedious work using Zerene Stacker that includes much careful hand work. I worked decades in Silicon Valley as a hardware electronic technician and test engineer often working through stereo microscopes looking at microcircuit printed circuit boards, unsoldering teenee tiny bad parts and resoldering in new parts with hand coordination skills that are also useful in subtle image post processing. To appreciate the image detail involved, select the enlarged vertical slice view. 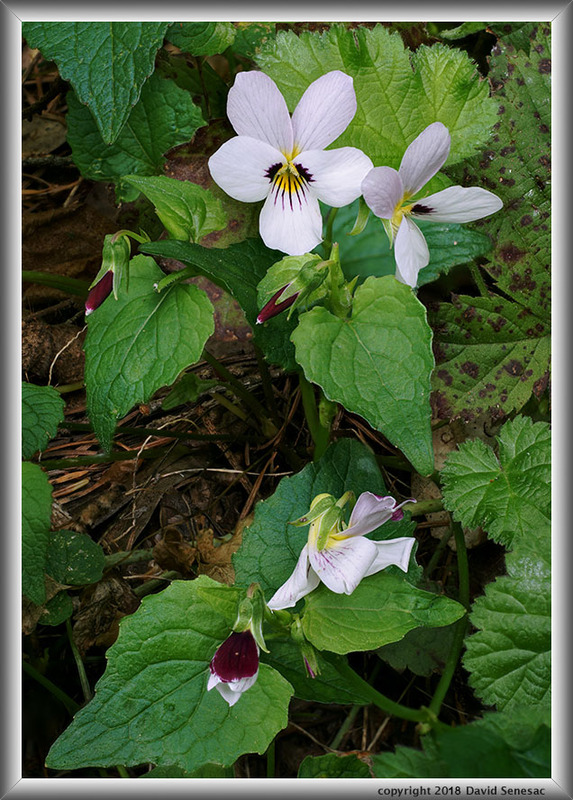 Another species along the dirt road trail in greater abundance than I've seen elsewhere were the pretty two-eyed violet aka western heart's-ease violet, viola ocellata. A short close to the ground subject that doesn't move easily by breezes. With the above subject, it still moved between frames enough that I spent a good hour in post processing. Note the dark purple spots on the two front side petals that form the two eyes with eyebrows. With this subject, I needed to include the background dried brown forest floor debris because it was close enough to the subject flowers to be in the unaesthetic middle distance range of not quite in focus. Thus stopped down to f16 to include a couple frames focused on those more distant elements. 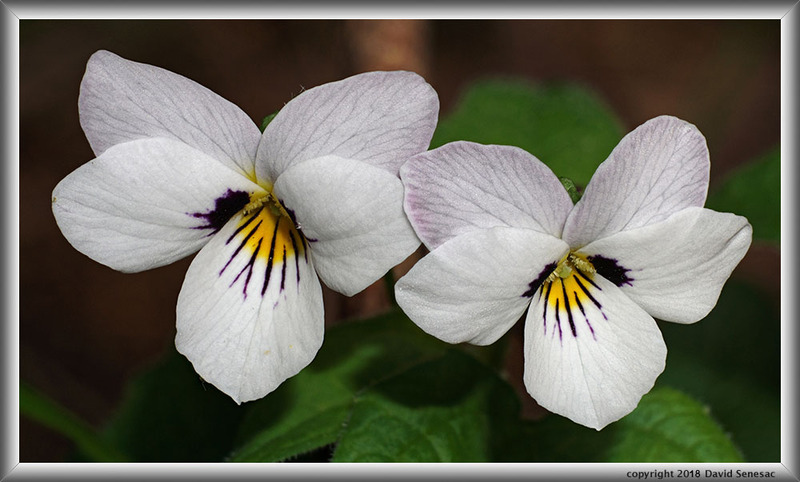 With so many little violets along the trail, I had an opportunity to carefully choose ideal subjects so went to work on the above pair of violets in the image at page top. Note the lighter purple veins on the two rear petals versus the deep purple lines on the front petal against its yellow patch. 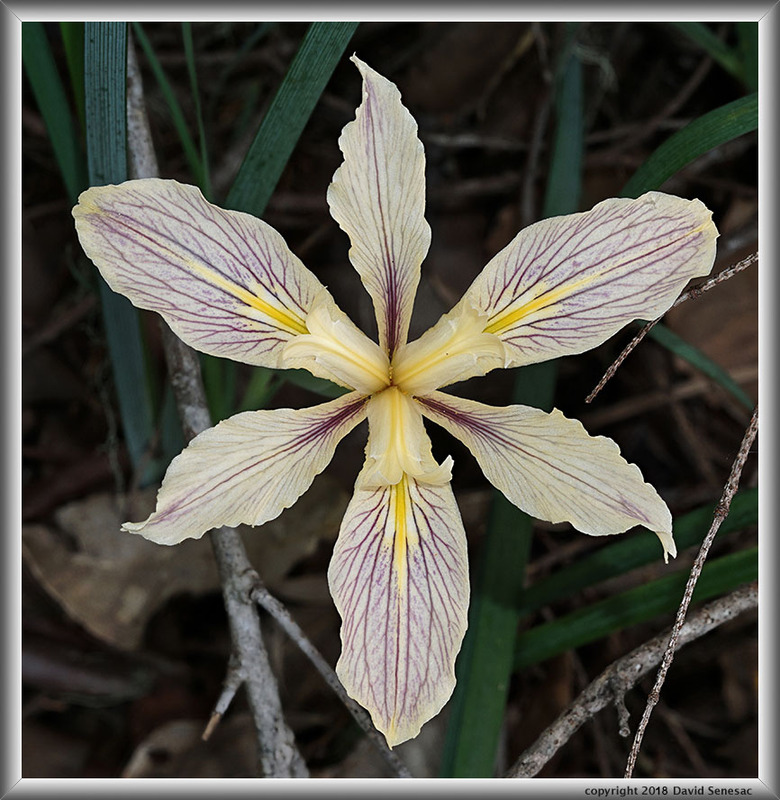 Another prominent and numerous species per image above was the large yellow hued with purple lines Fernald's iris, iris fernaldi, that tends to grow in clumps and is widespread in shady Santa Cruz Mountains higher areas. With breezes now making work more difficult, it was time to leave. Notice how for this subject well above the background ground, I chose a more traditional approach to capturing the subject leaving frame elements beyond the subject increasingly out of focus. 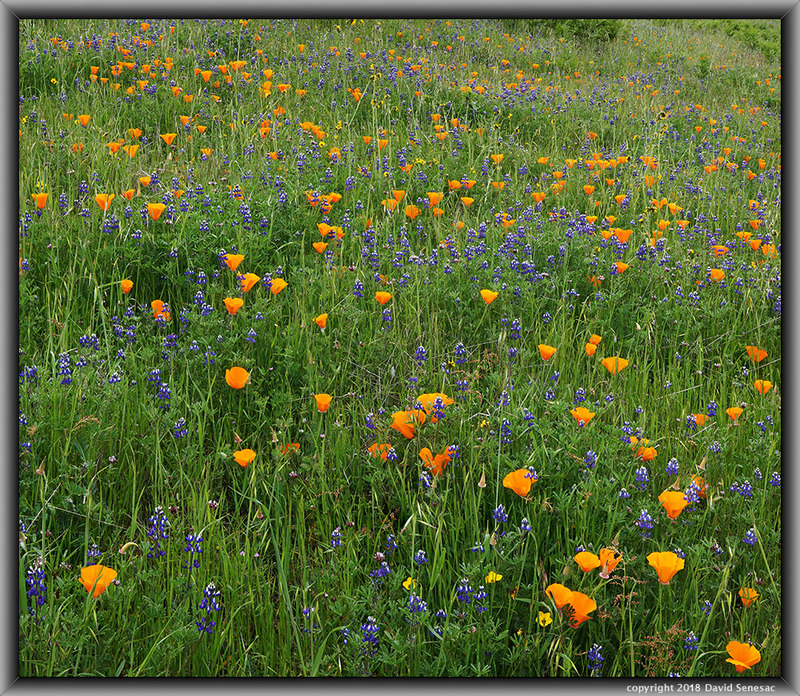 Late morning I was back at my vehicle, then drove north on SR25, aka Skyline Boulevard, to Russian Ridge Open Space Preserve that often has best displays of wildflowers in the Santa Cruz Mountains. I found peaking conditions with better than usual numbers of flowers than during most springs. Alien European grasses had by this time grown up higher than most native wildflowers, thus tended to be out of visual sight unless nearby looking down in the grasses. As usual, the best displays were on the east side of the preserve. The parking lot was full on this Saturday, so I drove along the highway to a familliar small pullout then walked off trail up and over a decaying old barbed wire fence. Considerable madia, poppies, white plectritis, miniature lupine, and purple owls clover were about, though the breeze kept me from using my camera until I could find a subject down low in breeze blocking grasses. About a small rock outcrop, I startled a fat black and white kingsnake while many western fence swift lizards were about in any bare soil or rocky areas. 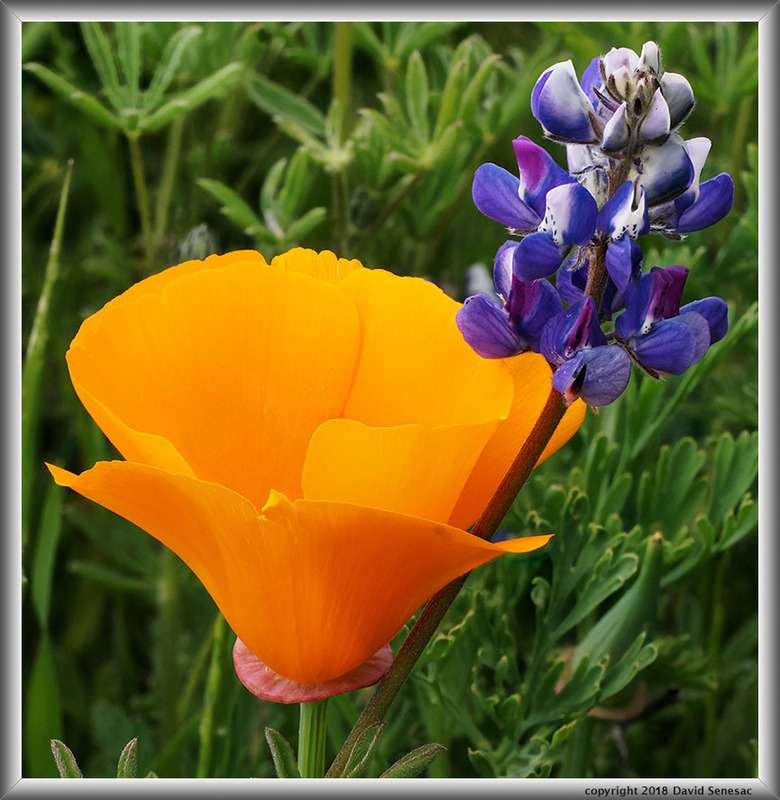 Looking for a mix of colors, I selected the above subject of a California poppy, eschscholzia californica, and miniature lupine, lupinus bicolor, while using my two circular disks to block the wind and diffuse the sunlight. The grasslands had good numbers of usual species, several of which I did not find subjects for that I could likely work in the breezes. There were areas of cream cups, platystemon californicus, and I found then worked this lovely side view subject above as more lulls occurred in the breeze. Despite the unaesthetic tall alien grasses, I worked 3 small modest landscapes including the above of a dense patch of California poppy and miniature lupine that also shows a few johnny-jump-ups, white-tipped clover, and filaree.